For more than half a century, Chanel’s life from 1941 to 1954 has been shrouded in vagueness and rumor, mystery and myth. Neither Chanel nor her many biographers have ever told the full story of these years. 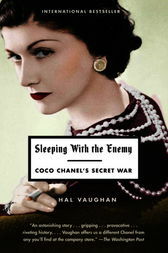 Now Hal Vaughan, in this explosive narrative—part suspense thriller, part wartime portrait—fully pieces together the hidden years of Gabrielle “Coco” Chanel’s life, from the Nazi occupation of Paris to the aftermath of World War II. "Hal Vaughan has done a stupendous job of research . . . Vaughan draws a brilliant portrait . . a terrific and fascinating story. . . wonderfully told, and full of great characters. . . Vaughan brings her to life so vividly that we understand why no less a judge than André Malraux said that "from this century in France only three names will remain: de Gaulle, Picasso, and Chanel.". . . It is that rarest of good reads, a biography about a famous person with a surprise on every page. Nancy Mitford, I think, would have loved it, and written a wonderful letter to Evelyn Waugh about it!" Hal Vaughan has been a newsman, foreign correspondent, and documentary film producer working in Europe, the Middle East, and Southeast Asia since 1957. He served in the U.S. military in World War II and Korea and has held various posts as a U.S. Foreign Service officer. Vaughan is the author of Doctor to the Resistance: The Heroic True Story of an American Surgeon and His Family in Occupied Paris and FDR’s 12 Apostles: The Spies Who Paved the Way for the Invasion of North Africa. He lives in Paris.